Zimbabwe's sacked Vice-President Joice Mujuru has agreed to pay compensation of $1.4m (£1.14m) to a white farmer whose land her family took, UK-based Zimbabwean journalist Violent Gonda has told the BBC's Newsday programme. 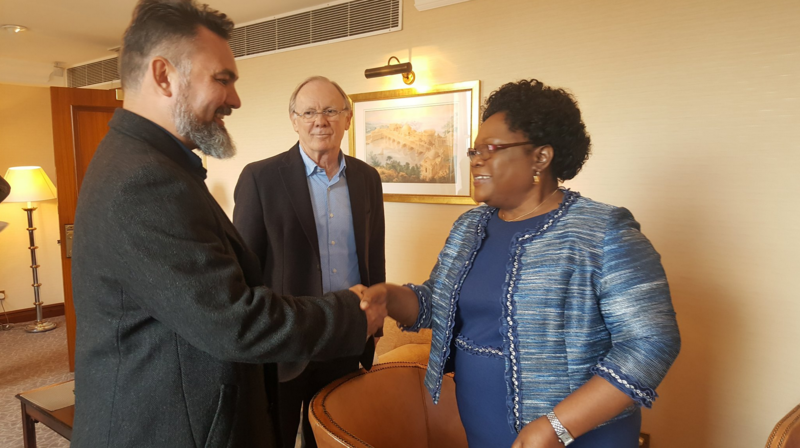 Ms Gonda organised a meeting between Ms Mujuru, who has launched her own party following her expulsion from the ruling Zanu-PF party last year, and Guy Watson-Smith during her recent visit to London. Back in 2000, Ms Gonda explained that Mrs Mujuru's late husband, army general Solomon Mujuru, had taken advantage of a controversial land reform programme to takeover Mr Watson-Smith's farm. Mr Watson-Smith, who travelled from Nice in France to meet Ms Mujuru, was one of the biggest tobacco producers in Zimbabwe at the time. After he was evicted, Mr Mujuru sold the crops the farmer had grown. Mrs Mujuru agreed to pay back $1.4m that Mr Watson-Smith lost from the crops, animals and equipment, but said she could not return the land because it was now owned by the state, according to Ms Gonda. Ms Mujuru also promised to pay his legal fees and interest on the compensation, Ms Gonda added. "It's been a long 15 years since we left the farm and it's been hard. My family started again in a new country from nothing. And we have pursued very slowly and very quietly through the courts." Ms Gonda says the question now is if Ms Mujuru will be able to pay. Her husband died in a mysterious fire on the appropriated farm in 2011. He was seen as a power-broker in Zanu-PF, which expelled Ms Mujuru after accusing her of plotting to oust President Robert Mugabe - an allegation she denied.